According to the World Health Organization (WHO) and the United Nations Children’s Fund (UNICEF), around 60% of the global population, or 4,5 billion people, either have no toilet at home or one that doesn’t safely manage excreta. To commemorate World Toilet Day, which is celebrated on 19 November, the focus will be on improving access to toilets and ensuring the availability and sustainable management of water and sanitation for everyone by 2030. In South Africa, the percentage of households that have access to improved sanitation increased from 61,7% in 2002 to 82,2% in 2017.3 Despite the improved access to sanitation facilities, many households continue to be without any proper sanitation facilities. However, according to the General Household Survey (GHS) 2017, the percentage of households that continued to live without any sanitation facilities, or who were using bucket toilets, has been declining consistently between 2002 and 2017, decreasing from 12,6% to 3,1% during this period. The report, released by Statistics South Africa, shows that the most rapid decline in households living without proper sanitation facilities was in the Eastern Cape (falling by -32,4 percentage points) between 2002 and 2017. Access to proper sanitation is important and must ensure that human rights and human dignity are preserved. The provision of toilets must also provide for the requirements of women and girls using public and community toilets. Shared toilets allow households who do not have toilets in their individual homes access to toilets. However, they do present a myriad of problems which point to health and safety issues in communities. 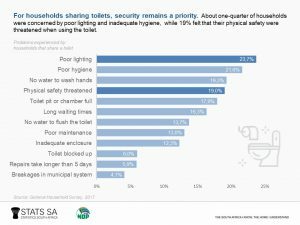 According to the GHS 2017, about one-fifth (23,7%) of households were concerned about poor lighting while 21,6% complained about inadequate hygiene. Going to the toilet is a basic human need. Women and girls are more at risk of attack and if the toilet facilities are poorly lit they cannot go to the toilet when they want or need to. Shared toilets or community toilets do not address the needs of women and girls who are at greater risk of harassment and sexual violence than men.1 Shared toilets are usually poorly maintained, ultimately posing a health risk for illnesses such as cholera and diarrhoea. Although washing hands after using the toilet is vital to control infectious diseases, 17,9% of households also complained that there was no water to wash their hands after they had used the toilet. Lack of basic sanitation indirectly inhibits the learning abilities of millions of school-aged children who are infested with intestinal worms transmitted through inadequate sanitation facilities and poor hygiene. Every year, millions of the world’s poorest people die from preventable diseases caused by inadequate water supply and sanitation services. Women and children are the main victims. 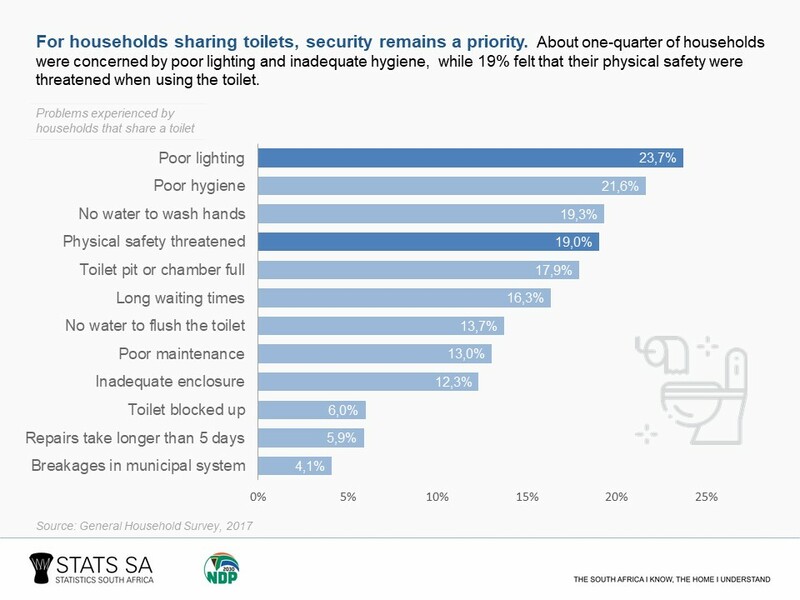 Other complaints included long waiting times (19,3%), threats to their physical safety (16,3%), and improper or inadequate enclosure of toilets (12,3%). In order to address poverty and under-development, the democratic government of South Africa has prioritised the provision of basic water and sanitation services to the poor because of the perceived high impact of these services on the quality of life of the poor.2 Ultimately, adequate supplies of safe water and adequate sanitation are necessary for life, well-being and human dignity. For more information on sanitation, click on the links below.